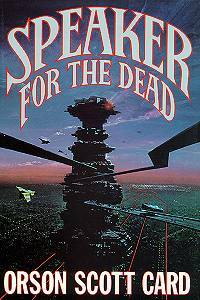 Description: Speaker for the Dead was the original sequel to Ender’s Game, but it now directly follows Ender in Exile. Chronologically, it is followed by Xenocide. “Three thousand planet-bound years have fled since Ender Wiggin won humanity’s war with the Buggers by totally destroying them. Ender remains young-travelling the stars at relativistic speeds, a hundred years or more might pass while he experiences a month-long voyage. In three thousand years, his books The Hive Queen and The Hegemon have become holy writ, and the name of Ender anathema; he is the Xenocide, the one who killed an entire race of thinking, feeling beings, the only other sapient race humankind had found in all the galaxy. The only ones, that is, until the planet called Lusitania was discovered and colonized.